Q: On the afternoon of November 21 local time, Zimbabwe's president Robert Mugabe declared his resignation. What's your comment on this? Will his resignation affect China-Zimbabwe relations? How do you comment on Robert Mugabe? A: The stability and development of Zimbabwe serve the Zimbabwean people's own interests and are the shared aspiration of the region and the international community. As a good friend of Zimbabwe, China appreciates the efforts of various parties in Zimbabwe to properly resolve the relevant issue through dialogue and negotiation within the legal framework with a view to the long-term and fundamental interests of the nation. We believe that the Zimbabwean people are capable of maintaining political stability and national development. China and Zimbabwe have enjoyed friendly relations for a long time and we have stood the testing of time and ever-changing international landscape. In recent years, the practical cooperation in various fields between China and Zimbabwe have continuously moved forward and brought tangible benefits to both sides. China always highly values its relations with Zimbabwe and stands ready to work with various parties of Zimbabwe to promote China-Zimbabwe friendship and across-the-board cooperation. As to our comments on Mr. Robert Mugabe, he has made historic contribution to Zimbabwe's national independence and liberation, and he is an active advocate and promoter of the Pan-Africanism movement. He has long been committed to China-Zimbabwe and China-Africa friendship and made important contribution to China-Zimbabwe and China-Africa relations. China respects Mr. Mugabe's decision to resign. He remains a good friend of the Chinese people. Q: According to reports, after Robert Mugabe resigned, the UK and the US called for a free and fair election in Zimbabwe. What's your reaction to this? A: China always upholds the principle of non-interference in other countries'internal affairs. We respect the Zimbabwean people's choice. We are convinced that the Zimbabwean people are capable of running their own business and hope that other countries will not intervene in Zimbabwe's internal affairs. Q: According to reports, the US Treasury Department yesterday unveiled yet more unilateral sanctions against not only the DPRK companies, but also Chinese companies and individuals. What is your reaction to the latest round of unilateral sanctions? A: As we stressed multiple times from this podium, China has always implemented the UN Security Council's DPRK-related resolutions in a comprehensive and strict manner, and our efforts are there for all to see. In the meanwhile, I would like to reiterate that we always firmly oppose the wrong act of imposing unilateral sanctions and "long-arm jurisdiction"by any country in accordance with its own law. Q: We have learned that former Zimbabwean Vice President Emmerson Mnangagwa will return to the country to take over the presidency. Do you have any expectations for him? A: With regard to China's view on the current situation in Zimbabwe, like what I said, as an overall principle, China always respects the Zimbabwean people's choice and upholds the principle of non-interference in other countries'internal affairs. In addition, the friendly cooperation between China and Zimbabwe is all-round and it benefits people of both countries. 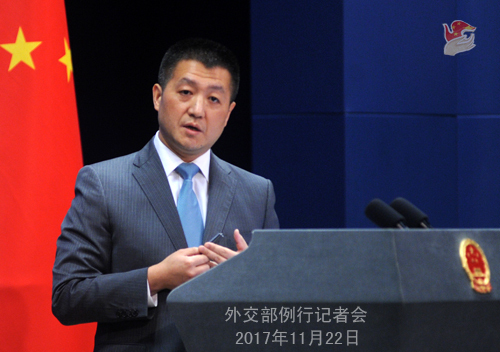 China's friendly policy towards Zimbabwe remains unchanged. We stand ready to proactively enhance the exchange and cooperation with Zimbabwe and scale China-Zimbabwe friendship to a new height in the principle of equality, mutual benefit and win-win cooperation. Q: First, is China going to investigate the Chinese entities and individuals having connections with the DPRK targeted by the latest US sanctions? Second, did China and the US communicate with each other on this round of sanctions? A: With regard to your first question, I just reiterated China's position. As a permanent member of the UN Security Council, China has always strictly observed and implemented all the resolutions of the Security Council. If any Chinese citizen or entity engages in any activity that violates China's laws and regulations and international obligations, we will strictly investigate and punish them in accordance with law. As we said, for any party that is willing to conduct effective cooperation with China on this sort of issues or has any information well and truly, it can just properly handle the relevant issue by sharing information and cooperating with China. 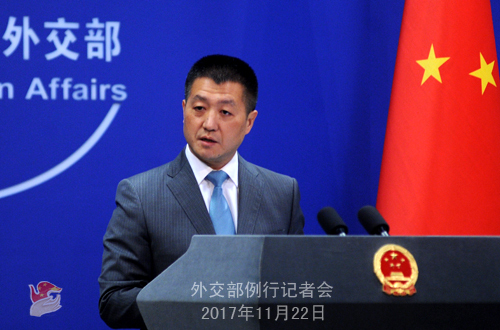 However, as a principle, I need to reiterate that China opposes the wrong act of imposing unilateral sanctions and "long-arm jurisdiction"by any country in accordance with its own law. Regarding your second question, the US is always clear about China's position. Q: The US-China Economic and Security Review Commission of the US Senate released a report this month. It once again criticized the China-US trade deficit, and that the treatment of foreign investment in China continues to deteriorate. What is your reaction to this report? How do you assess the potential damages to China-US relations from these elements of the US politics? A: The so-called "commission"you mentioned has deep-rooted bias towards China all along. It will be a tragedy if the US administration and Chinese government departments base their policies on the conclusions of such a commission. As to China-US economic and trade relations, as we said many times, they are mutually beneficial and win-win in essence. During President Trump's visit to China, the two sides reached important and fruitful outcomes on deepening bilateral economic and trade cooperation and sent out a positive message of sustained and steady development of China-US economic and trade cooperation. We believe most of the people among the Chinese and US business community and international community, who can look at China-US economic and trade relations in an objective and unbiased manner, will make positive anticipation out of those important outcomes reached by the two sides. We urge this above-mentioned "commission"to stop their irresponsible words and deeds on China-related issues. They should do more to promote the sound development of the relations and mutually beneficial and win-win cooperation between China and the US if they truly concern themselves with China-US relations. Q: According to Yonhap News Agency, Foreign Minister of the Republic of Korea (ROK) Kang Kyung-wha arrived in Beijing on November 21 to start her visit here. Will the THAAD issue come up in the discussion between the two sides? A: China's opposition to the deployment of THAAD system in the ROK by the US is consistent and remains unchanged. No long ago, China and the ROK reached some consensus on dealing with the THAAD issue in the current stage. We hope the ROK will make concrete efforts to continue to properly handle the relevant issue and work with China to improve our bilateral relations. Due to scheduling reasons, tomorrow's press briefing will start at 2:30 p.m. at the same venue.